The Inclusive Sound Festival gives a platform to groups whose members, either with or without disability, make music together. It is the festival's goal to present their activities to a broader public. On the occasion of the festival and with the support of the mdw - University of Music and Performing Arts Vienna and the Vienna School of Music, we have produced a song which, in line with the festival motto, is performed by singers with and without disabilities. The CD (including vocal version, karaoke and instrumental track) as well as notes of the song are available at Musikhaus Doblinger. Download version also available at Amazon and iTunes. 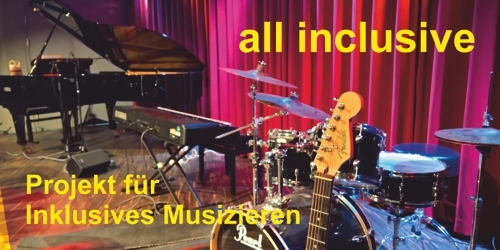 In cooperation with the Vienna School of Music, we have created the project 'all inclusive' which enables people with and without disabilities to make music together. Once a week, talented people with disabilities are given the opportunity to study songs in an ensemble of the School of Music under professional supervision and to undergo vocal training.